Woah, is this the mythical disco ball of death??? How do you unzip the iso things? You can use WinRAR to unzip them, but .iso is a CD image, so it works better if you burn it to a CD. Am I correct in understanding that they intended to use an 'upgraded' Vision Engine for the game? Say it backwards and you'll realize that's a silly question. I'm sure someone with actual photoshop might be able to do a better job. And there's also a version on the disk without the motion blur added to the starfield background. Um.. AD, that appears to be the Vampire in the image pack.. This statement confuses me, was that a yes or a no? And your are completely correct... Somehow my brain saw a vampire but it came out Piranha. Conversely, this explains the dreadful horror movie you directed. Hah.. its funny.. but they filmed parts of "Piranha" at Aquarena Spring, in San Marcos.. and I worked there when I was in High-School.. I used tell people about it when I drove the glass-bottom boats there.. ahh.. goood times.. good but less than minimum wage times.. I wonder if that is why I always had a soft spot for the Piranha in WCP..??? You mean the one with the blood-sucking immortal fish? That was all the scripts fault. I just put what was on the page to the screen. You can blame me for that other one with the baseball bat carrying vigilante who takes out his aggression on a deck of cards. I might have a tinker around in GIMP... but how do you think it compares with the prompotional Vampire image. Just no warping effect in the background, I suppose. It's the same image but without the motion blur applied to the background(2850x2775). The non warping one is on the disk too, So I can make wallpapers of that if people want it. I've attached the full res Jpeg version. 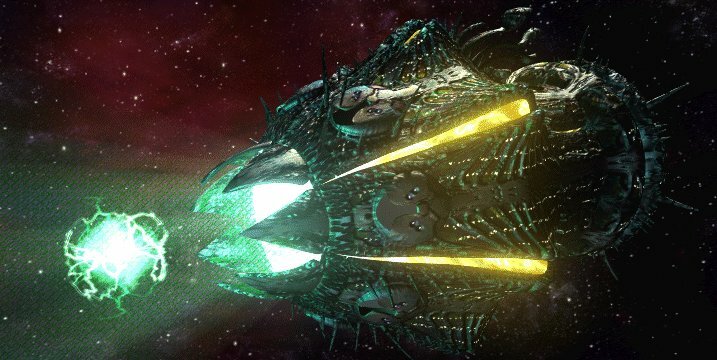 There's a crazy 7500x3000 of that midway image too: http://outlander.solsector.net/vid_files/7500x3000.jpg Wallpapers of that would sadly cut off a lot of the image. Plus a 5250x2700 of the Nephilim ship and fighters in the link you posted. But I don't know if the lines and text in that particular one are in a removable layer or not. Finally had time to look through the files today. If those file sizes seem big, remember that the original Photoshop files are much bigger. Any decent editor which can apply interpolation with scaling can be used to resize the images down to a suitable resolution for a given monitor. Edit: It also seems to me that the images from the "Manual" folder matches those of the ICIS Manual. Time to update my kludy substitutes.